Today’s the day, the final edition of “Making the Most of Your Polymer Clay Studio.” This past month myself and Ginger from The Blue Bottle Tree have brought you a collaborative series of posts. I hope you have enjoyed them so far. In case you missed one, I’ve put the links to them below so you can check them out. Today’s article is by Ginger. To accompany hers, I will write my own today and I will tell you how and where you can reclaim, repurpose, thrift, & find some bargains that you can turn into useable & functional items in your polymer clay studio. READ THE ARTICLE NOW. Welcome back to “Making the Most of Your Polymer Clay Studio.” This month myself and Ginger from The Blue Bottle Tree are bringing you a collaborative series of posts. I hope you have enjoyed them so far. In case you missed one, I’ve put the links to them below so you can check them out. There’s valuable information in each article, so don’t miss them. I hope that you will continue to join us and chime in with your comments, thoughts, & ideas as well. As you read in my post last week, we focused on “Falling in Love with Your Studio, no Matter its Size.” This week Ginger takes that one step further and explores ideas on how to create that studio that you’re craving. She delves into all kinds of ideas surrounding building your own craft space: from converting an existing space, stealing a space, functional furniture, cart trolley’s and much more. Welcome April! 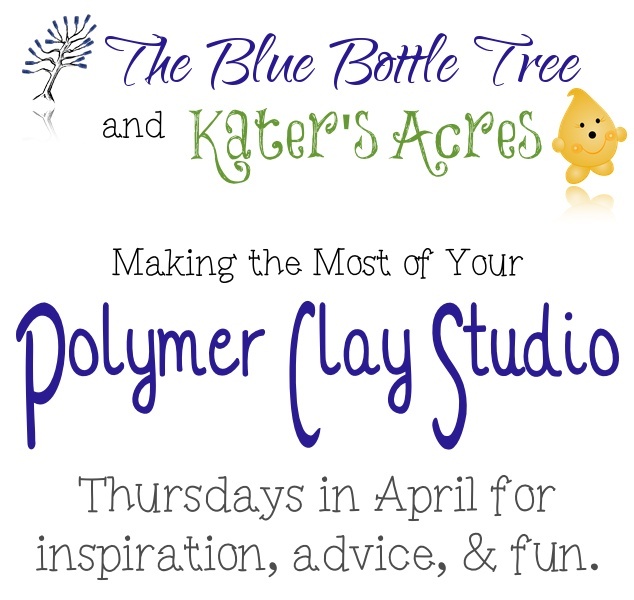 This month myself and Ginger from The Blue Bottle Tree are bringing you a collaborative series of posts, “Making the Most of Your Polymer Clay Studio.” Each Thursday in April you can join me and Ginger as we talk about a topic relating to “Making the Most of Your Polymer Clay Studio.” I hope that you will continue to join us and chime in with your comments, thoughts, & ideas as well.